Remember when I said I don’t bake? You certainly wouldn’t be able to tell from the looks of this blog as of late. I do like challenging myself and trying new things – in fact, I’m considering asking if I can join those fancy folks over at Daring Bakers. See this chewy and delicious bar on the left? Yeah…I baked it. However, it’s not from scratch. In fact, it’s not even "dessert". It’s a pretty yummy product that I received from a company called Matisse & Jack’s. I don’t normally talk about products on this blog…but these are great quality and I think people who read here might enjoy them, too. 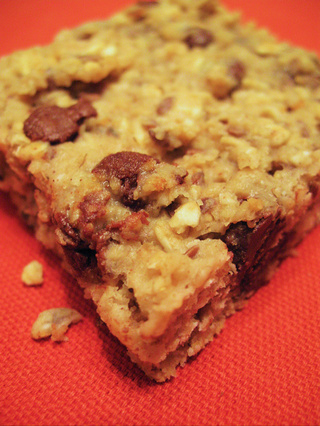 They make bake-them-yourself energy bars! If you’re like me, you often don’t have time for breakfast or to make something before you head out the door or to the gym. I’m a big fan of energy and granola bars…but normally once I eat them, I just feel guilty about shoveling in all that added sugar and preservatives. The packaging provides you with several ways to make the bars so you’re able to control the amount of sugar or dairy that you put into them – and you can customize them with extra ingredients to your taste. I tried both flavors – chocolate chip and cranberry – and I was really impressed with both types. They had an interesting texture – chewy and soft but still dense. The other great thing is you’re able to cut them into whatever size pieces you want – larger "bar" sized servings (I got about 9 bars out of a package!) or smaller "pick me up" snack bite size. Go visit Matisse & Jack’s for more info on the products, how to order, and recipes using the mixes! An energy bar you say? That sure doesn’t look like an energy bar! They are geniuses, not just because they’ve made an energy bar look like a dessert, but they know that the fresh out of the oven texture is necessary to really enjoy a baked product. they do have a dense consistency that is more in line with some of the all natural/organic health & energy bars that are out there…. that having been said, it was really delicious and certainly *was* delicious a few minutes out of the oven.